This manual has been discontinued but we sometimes have one in stock. See above for current inventory. 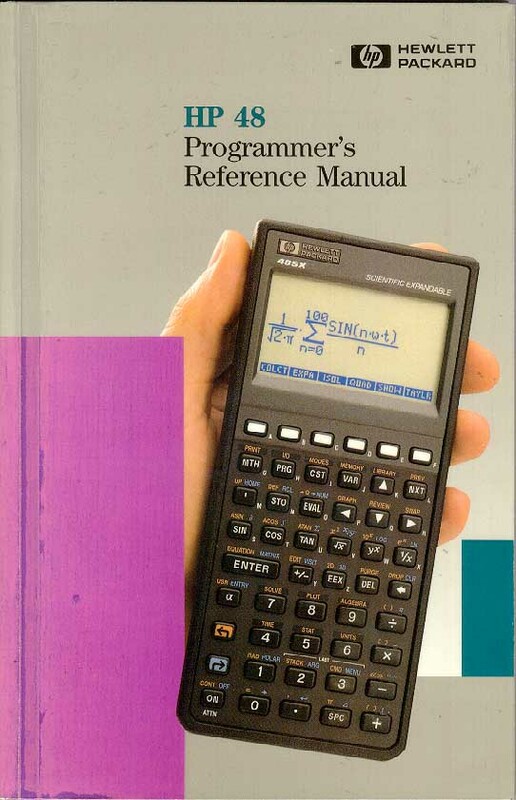 This manual contains concise reference information for the HP48: a brief, alphabetical listing for each programmable keyword, and tables of error messages, units, flags, and reserved variables. The HP48 Owner's Manual, on the other hand, contains conceptual, descriptive information, organized by subject area and menu. Command Dictionary: the main part of the manual. Organized alphabetically by command, it summarizes each programmable operation. The syntax appears in a stack diagram that shows what each keyword requires as argument and returns as results. Table of Error and Status Messages (appendix A): an alphabetical listing of error and status messages. Table of units (appendix B): definitions of the types of units available in the HP48. Reserved Variables (appendix D): lists the reserved variables and their contents. Printed in 1990 for the HP48S/SX series.